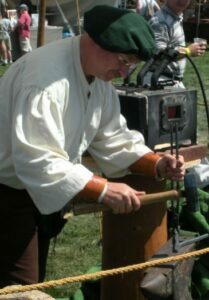 Our Blacksmith attends many of our festivals with us, making many common household items, things that kept all manner of things together, such as nails, hooks, and holders. While the items are utilitarian, they exhibit varying degrees of artistic ability, with twists, turns and shaping to give them a unique look. Our blacksmith (and his apprentices) will be demonstrating how these items were made when they are at the forge. Blacksmithing was invented by the Hittites of the Fertile Crescent region of the Middle East sometime around 1600 BC, but the principles by which iron could be worked were developed prior to 5000 BC. The Hittites used this knowledge to make iron weapons, which were far superior to those made from bronze, which neighboring tribes made using these new weapons to subjugate their neighbors and enemies. The methods they used, though primitive, are not much different from those that are employed now to smelt iron. Blacksmithing is known as The King of Crafts, as the blacksmith made most of the tools for the other crafts, and the blacksmith was a vital person in every village. Our blacksmith uses a modern forge. This is a concession to the high fire danger at many of our venues during the summer months when our festivals occur.